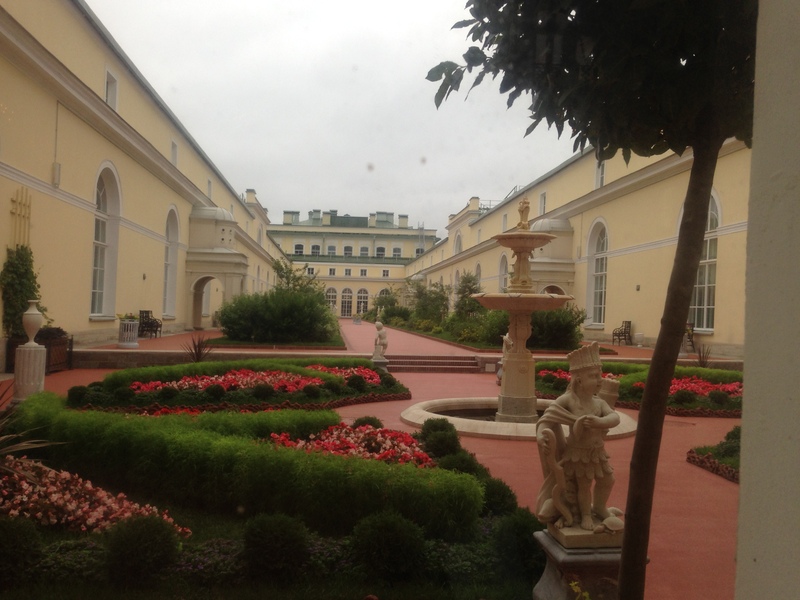 Vasilyevsky Island hosts some major museums, the university, and the Menshikov palace.These are the obvious gems. 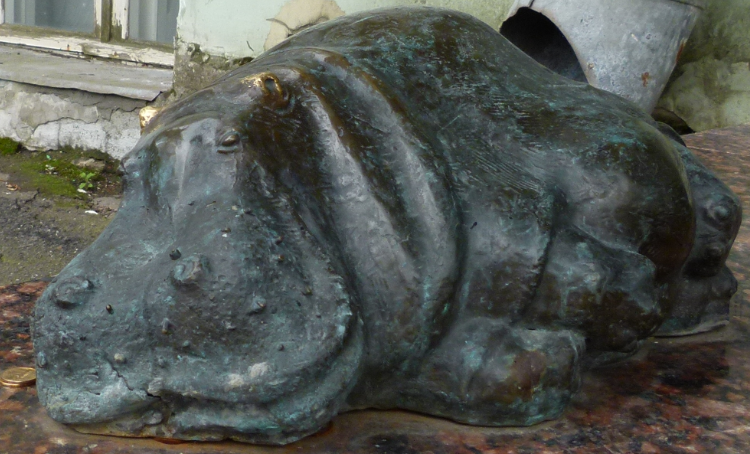 There are also some more hidden gems like the street Line 7 and some small sculptures that my wishes guidebook knows of. Also Dostojewsky’s Rasumichin lived here overseeing the Malaja Neva. Today, I want to discover this island. As I walk on the Dvorzoy Bridge, a man asks me in Russian: “Where is the Kunstkamera?” This is the museum of ethnology and anthroplogy that Peter the Great founded on Vasilyevsky Island to educate the Russians. I show it to him and continue my way towards the north side of the island up to Tuchkov Bridge, then turning to the middle of the island. A young lady asks me, where the Bolshoy Prospekt is. I can show it to her. Why are all these Russians asking me for direction in their town? 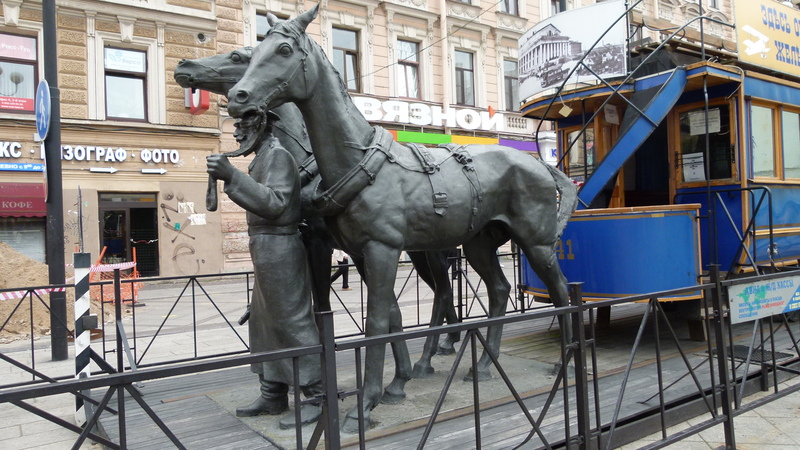 At the metro station there is a monument of the first tram in town, pulled by horses. 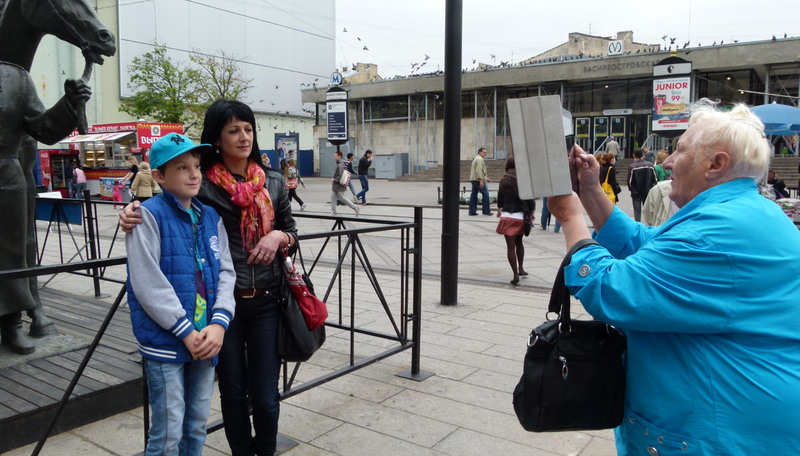 The Russians like to be photographed with it, also mum with her son. Grandma holds the iPad. The boy asks her several time to redo the photo, until he is pleased. The street system is quite straight forward: There is a small, a middle and a large prospekt and perpendicularly there are streets called lines. Line 7 is a pedestrian zone, with a shady alley and inviting restaurants along the sides. I sit down on a bench and eat the salmon sandwich that I had bought at the French Busche (Boucher is Буше in Russian). Можно? (Is it permitted?) someone asks me. I do not look up and say yes. Two drunken men start to chat with me, and one of them touches me. No! 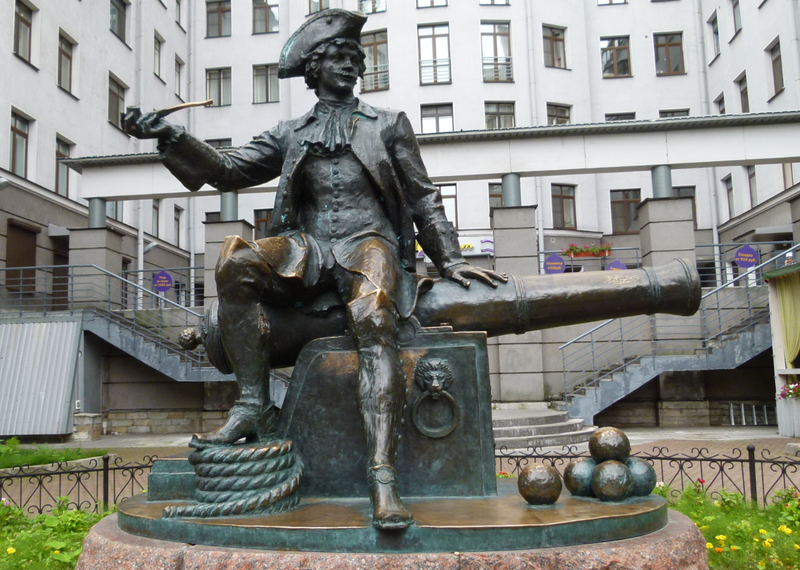 I continue my way, say hello to Vasily Korchmin (who may have given his name to this island; he was an imventive lieutenant of Peter the Great). In St. Andrew’s church I light three candles thinking of Ernst. Menshikow was one of Peter’s main architects. Peter the Great asked him to build the university on Vasilyevsky Island. He built it with the short side to the Newa, and next to it, he built his palace with the long side overlooking the Newa. Such a Schlitzohr, as we say in German; I believe this is “shark” in English. His palace is a museum now. At University Embankment 11, I find a guarded entrance. 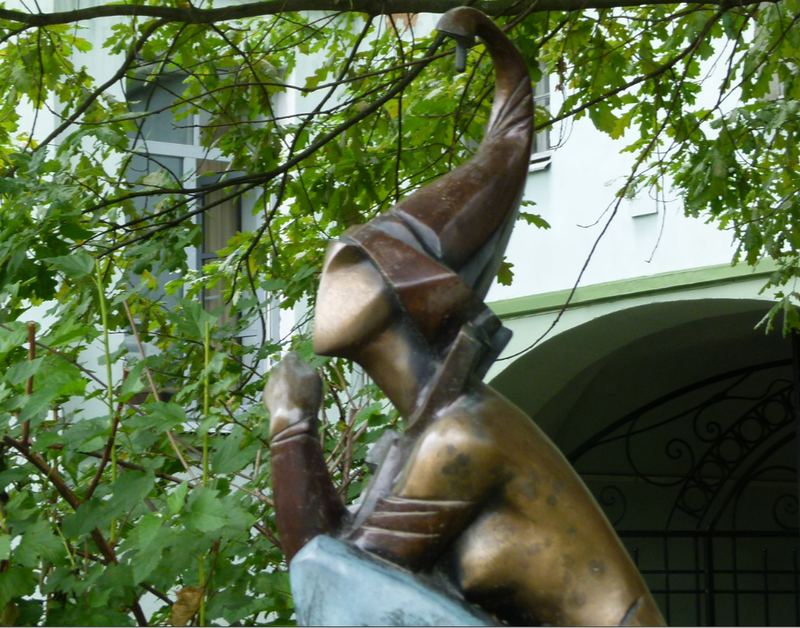 I ask the guard, where the sculptures are that I have read about… and she answers: “yes, we are proud of them, I will show you the way.” She takes me into a nice garden. “Look, here is our begemot (hippo). Rub it, and you will get married.” Hm, no need to rub it, Ernst is in my heart. I take a photo… and the guard supports me to select the perspective. Look, here is the Petit Prince. 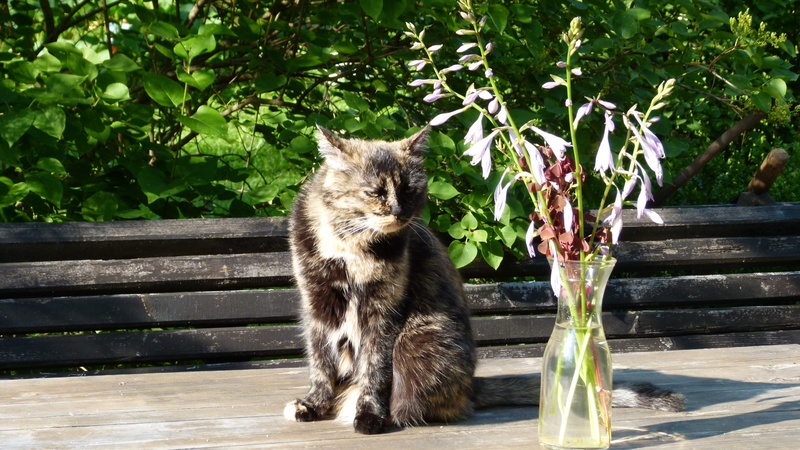 And at the other end of the garden, there is Columbina… yes, she likes her garden and she likes to share it with visitors. 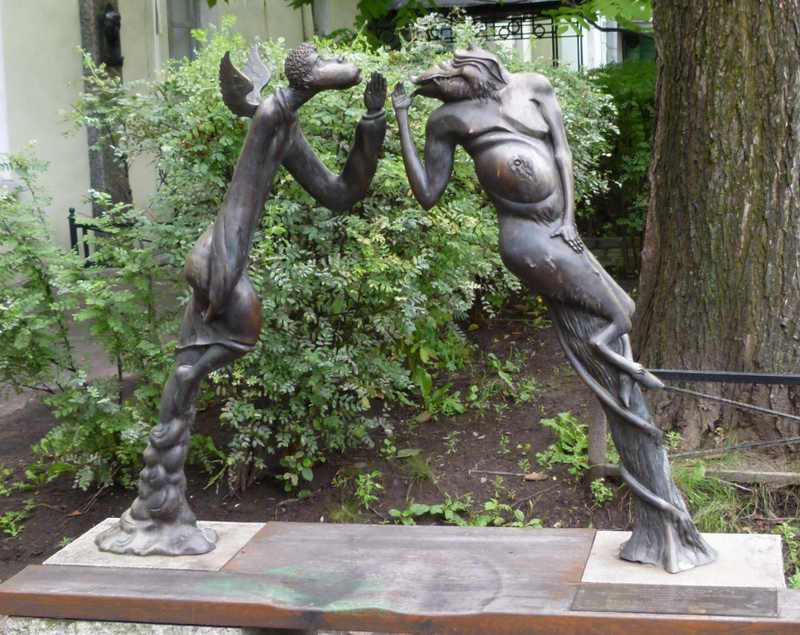 And I find many more sculptures, also an angel and a devil. Behind the Kunstkamera there is an unpretentious gate to a dirty yard full of rubbish. The walls are flaking off. In the middle some trees with banks. I already want to leave the place, but then I see small granit blocks between the banks. Yes, these are the Aztec gods. I sit down on one of the benches and say “hello” to them. How did they get here to live in this ugly place? A man sits down next to me. “What are these stone blocks? 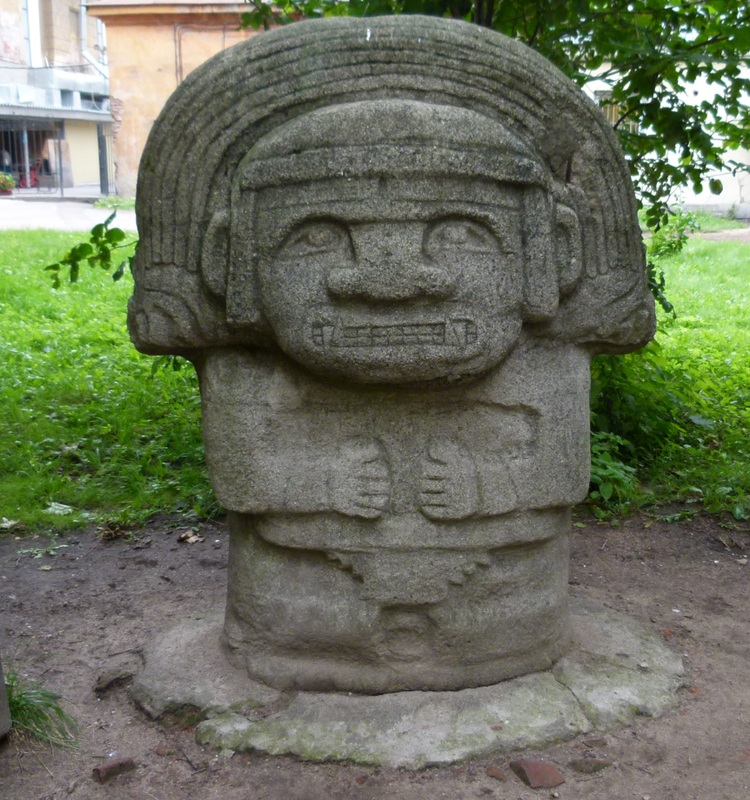 Aztec gods? Where are they from?” I tell him about Mexico and about Tlaloc, the god of rain who has a huge nose, because he might have a permanent cold (this is how I think of Tlaloc). 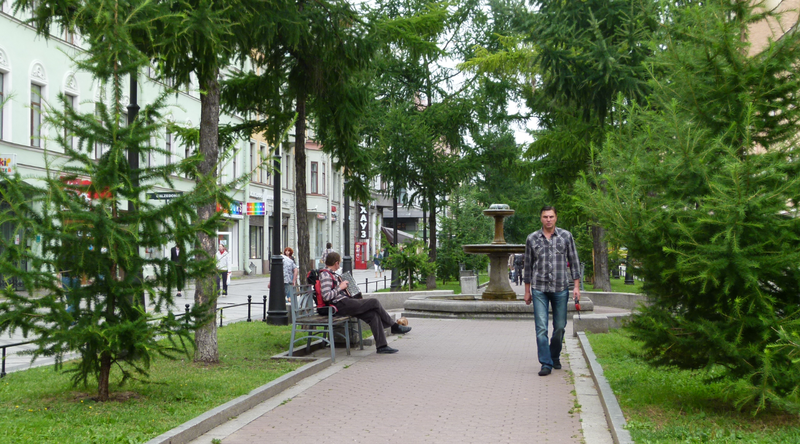 He laughs and tells me that he is from Siberia, has lived in Piteri for eleven years and does not know this town well. His children join him and they continue their way. The entrance to the museum of zoology is a small door. Today the entrance is free. 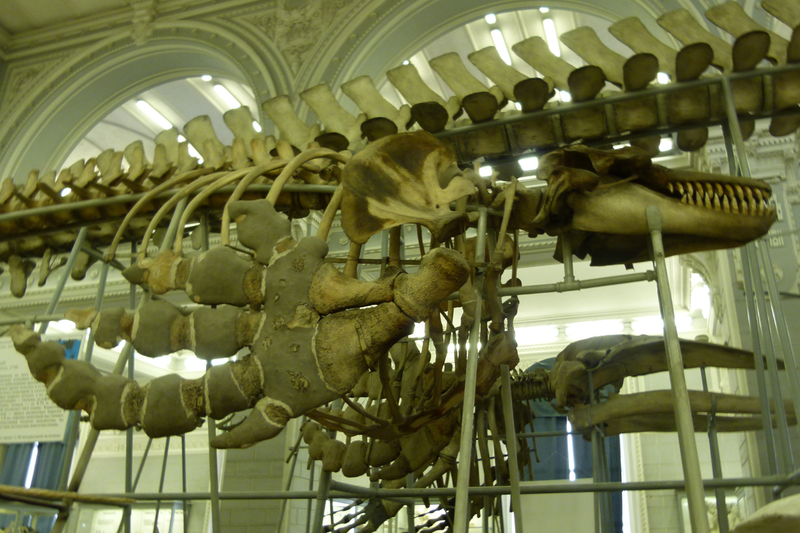 There is a huge hall with skeletons from dinosaurs and various fish. 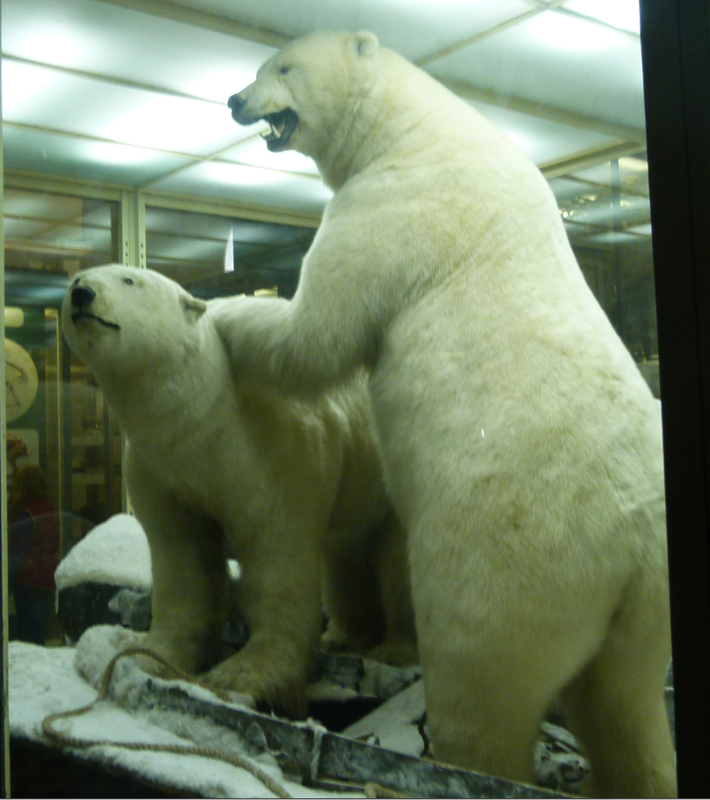 There are long gangways with a wealth of vitrines showing stuffed animals, set up in their natural environment. E. g. polar bears on (cardboard) ice and wooden boats. 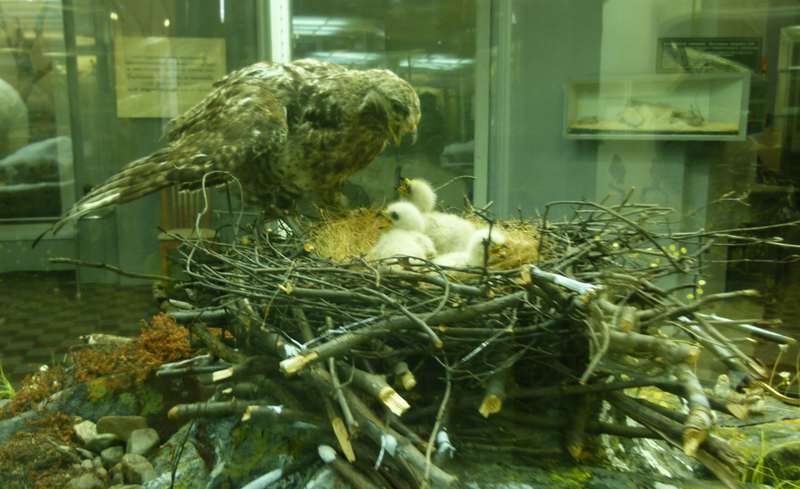 Or storks and eagles feeding their young waiting impatiently in the nest. Or wolfs in the steppe etc. 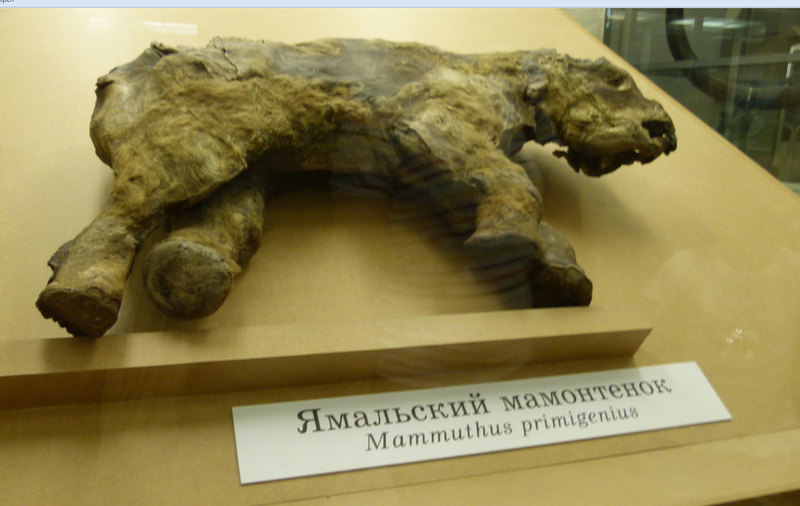 And mammoths that come from the Siberian ice. Families with children are strolling along the vitrines, benefiting from the free day. A great institution. There is also an exhibition of insects here – I buy a book about insects for the daughter of Anna, my teacher in Basel. Now have to get back to Raskolnikow’s house to take a short walk with Elena’s Pekinese dog Susja and to tackle my next Russian lesson. Eventually I decide to visit the Ermitage again; I have been there with Ernst eleven years ago, and I was not convinced whether I would like to see it. Too many memories. I dive into the palace around eleven, climb the superbe Jordan staircase, receive some guidance from Ludmilla and take the detailed Lonely Planet map under my arm. It is so easy to get lost in this maze! I always make sure that I know, where I am and where I want to navigate to next. And I plough my way through all these tourist groups that follow a guide; the most inventive guide was a young and tall man who just holds his arm full of tattoos into the air. He was easy to spot. I first stopped by at the hidden treasures. These are impressionists that the red army took back from private collections in Germany. No fotos allowed in here. 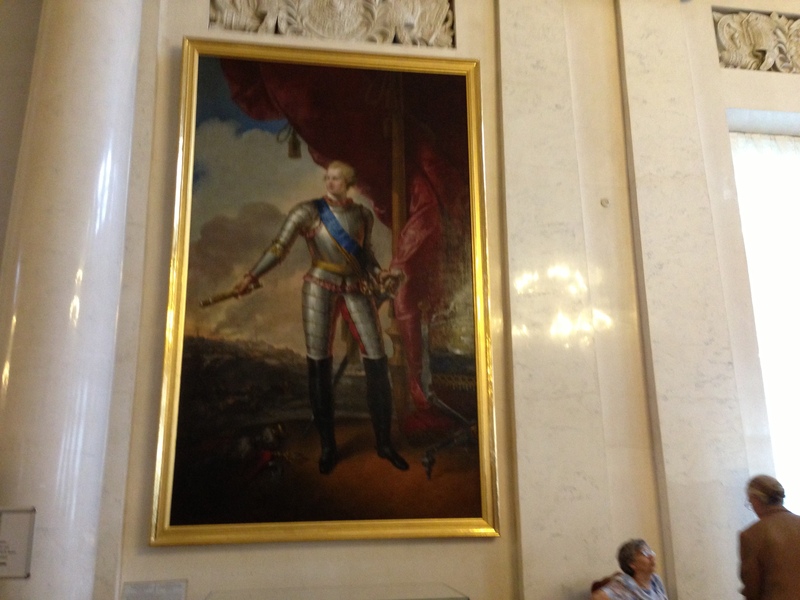 I then admire the handsome Potemkin, one of the lovers of Catherine the Great, and stroll through the luxurious Great Hall and Malachite Hall. 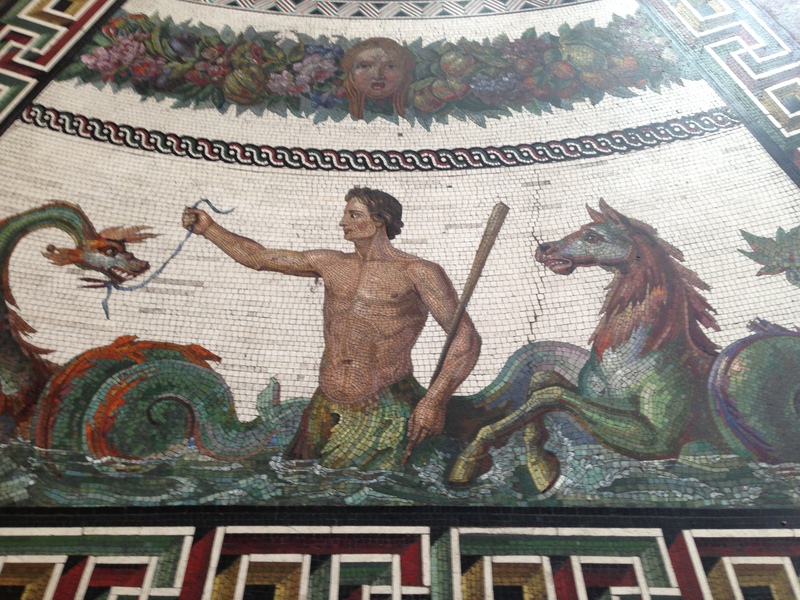 I enjoy the hanging garden and the mosaik in the Pavillon Hall. 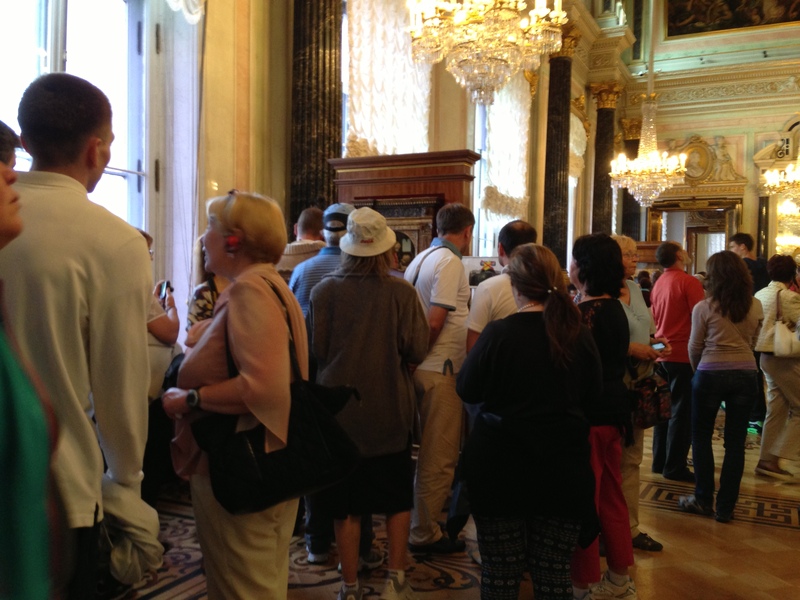 Now the density of tourists and groups is getting higher and higher. They all admire Rembrandt’s pictures in the room reserved for him. Interesting that in the war, the Russians had evacuated this collection and just left the frames here. 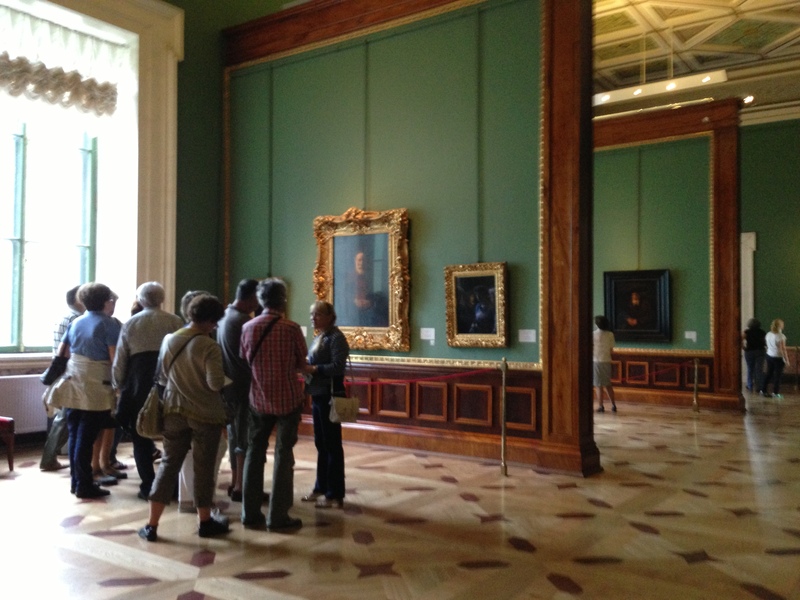 The flamish artists, the Italian artists, and again a high density if tourists; I am now in Leonardo da Vinci’s room. Two Madonna pictures are here, and I am again astonished, how small they are. The next point of high tourist density is in front of Michelangelo’s statue – no foto from here. I admire the architect who set up the rooms in this palace… curtains and wall paintings are always a perfect match, and each room has a different color. 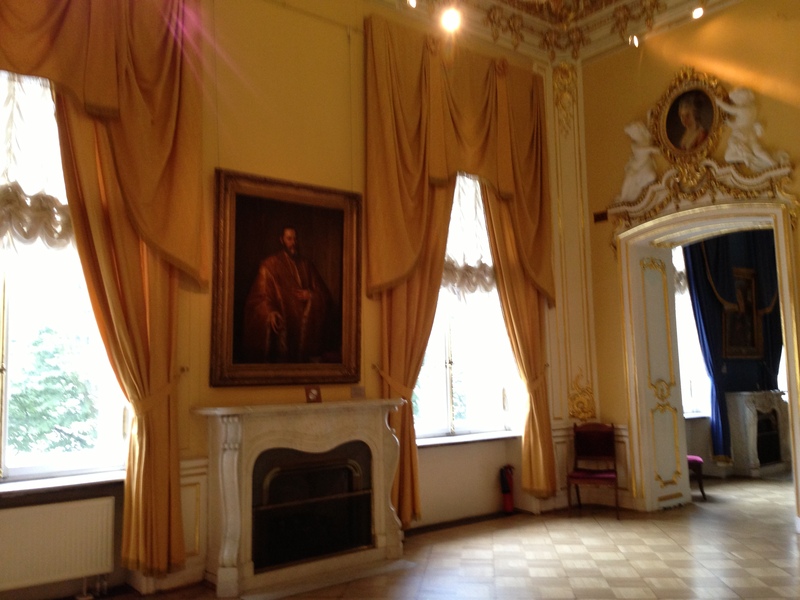 Here is the yellow room. The Ermitage is missing out on a great business opportunity which is to sell food and drinks to the tourists that spend long hours here and surely are getting hungry. There is a cafeteria on the first floor with a short queue and a very small selection of rubber sandwiches and snacks like Mars or Bunty. I eat a salami-cheese sandwich that is a bad match to all the luxury and pieces of art in this palace. I eat it sitting at the base of a column, as there are no chairs available. 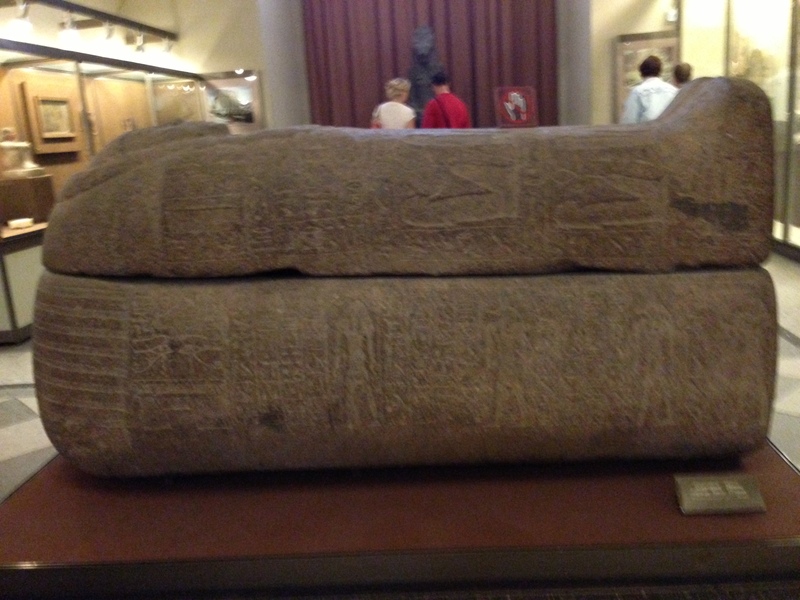 After my break, I visit the Egyptian department with the mummies and sarcophags. 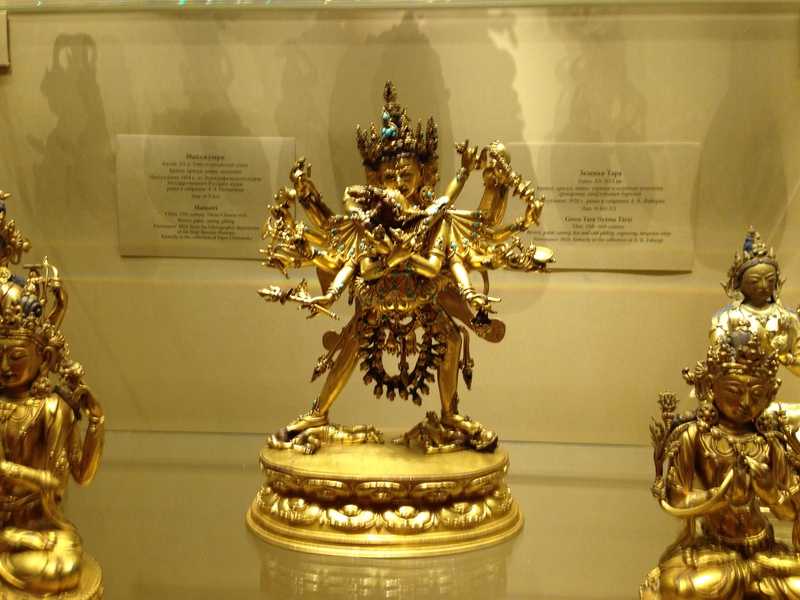 I miss out on the treasure gallery. It already astonished me eleven years ago that the Ermitage hides away these gems, the impressionists and Picasso, and how well the tourists find them nevertheless, climbing some small and ugly stairs to the sober third floor. The gems are displayed in plain rooms with a low ceiling, and they are just great, Renoir, Matisse, Monet, Manet and also Picasso. 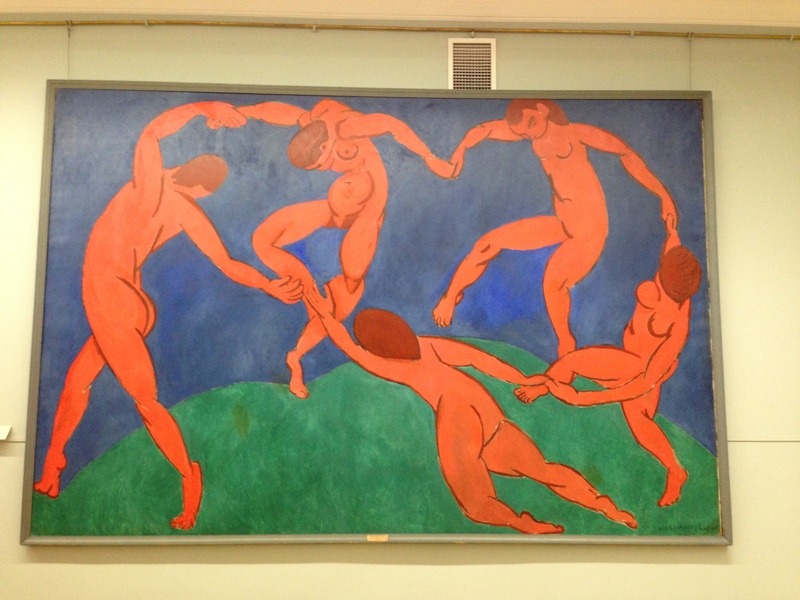 I sadly stand in front of the dancers of Matisse remembering, how much Ernst enjoyed them, and now he is with me in my heart. I stroll up and down these rooms several times and then move to the exhibitions of Japanese, Chinese and more Asian pieces of art, in particular along the silk road that some Russian travellers and scientists explored. I will be at some places of the silk road later this year, in Mongolia. 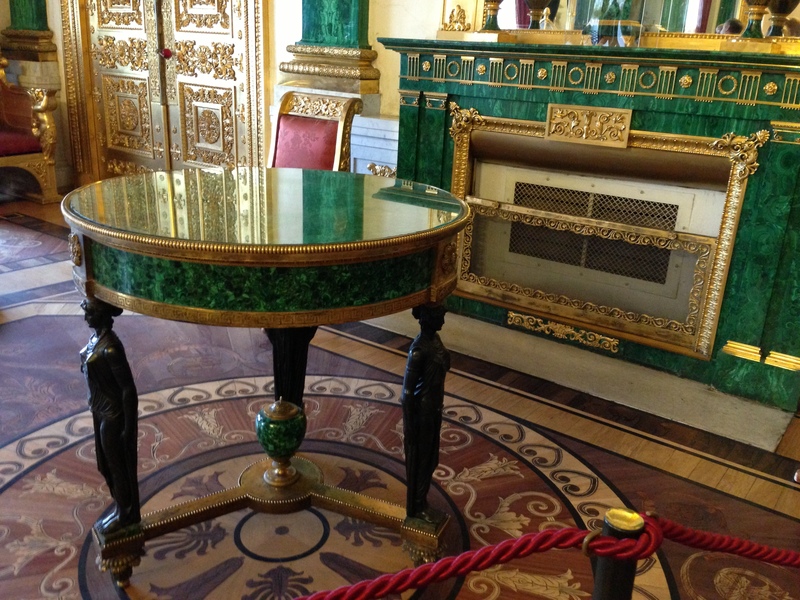 I round off the visit by walking through the royal rooms admiring the elicit furniture and decoration. 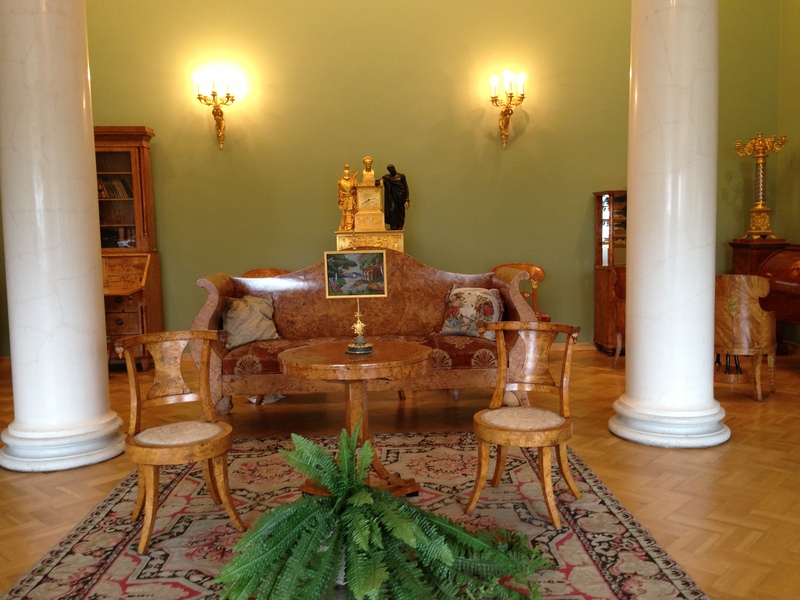 Yes, Nikolai II did not like this luxury so much and prefered his smaller and more cosy palace in Zarskoe Selo. Now my legs feel like “Weggli” which means literally like “rolls” (in Russian: дереянные ноги). When we Swiss say “Wegglifiess”, we mean that we can no longer walk two more steps. No wonder, I have walked through the Ermitage for four hours now. Nevertheless there is another 15 minutes’ walk ahead of me, before I will tackle my next Russian lesson. 1. In a suburb of Marseille, Gaspar and his children, 18 year old Jeanne and 9 year old Jacques, pull a cart with firewood, lose a wheel, come across Marquis de Beauregard who throws over the cart and beats Gaspar, and receives then support from the revolutionary squad led by Philippe. Then there is a ball in the palace of Louis xvi – he signs an order to call the Prussians for support against the revolutionary uprisings. A couple, Mireille and Antoine, dance for the court, Antoine is shot, Mireille gets ahold of the signed order and carries it away. 2. In Paris the squads from various regions of France come together, see the order to call the Prussians, and storm the palace successfully. 3. The people celebrate the victory and the marriage of Philippe and Jeanne. Larissa picks me up, and we soon find a parking slot directly in front of the Michailovsky Theatre. This theatre is a place full of atmosphere with red carpets, and the Russians dress up nicely for it. I enjoy this very much. We buy a program brochure and order a table and champaign for the entr’act to avoid the queue at the buffet. Larissa is well organized, as always. Our seats are in the parkett. We go back to watch the second act, where the revolutionary troops capture the palace. And the third act, where the victory and the marriage are celebrated. The dancers show all their skills, spnning and spinning elegantly on their toes. jumping and then landing perfectly, Philippe carrying Joanne on his hands, while the music matches the dancing nicely. But I start to feel, it is almost too perfect and too virtuous dancing demonstrating all skills of the classical ballet. Why was the classical ballet brought to perfection used to celebrate the 15th anniversary of the October revolution? Is such a ballet not a pre-revolution thing? Well, I agree that Russia can really not be understood with rational thinking, as even the Russians say about themselves. Yes, Russia has its special character. On weekends, I am now a regular guest at the small and cosy datscha of Larissa, tucked away in the forest. The garden is taken care of by mum. There are hydrangea and lillies, and there are herbs, salad, red currant, black currant, strawberries, cucumbers and more. A great Karma to own this paradise, and this is also the name of the cat. 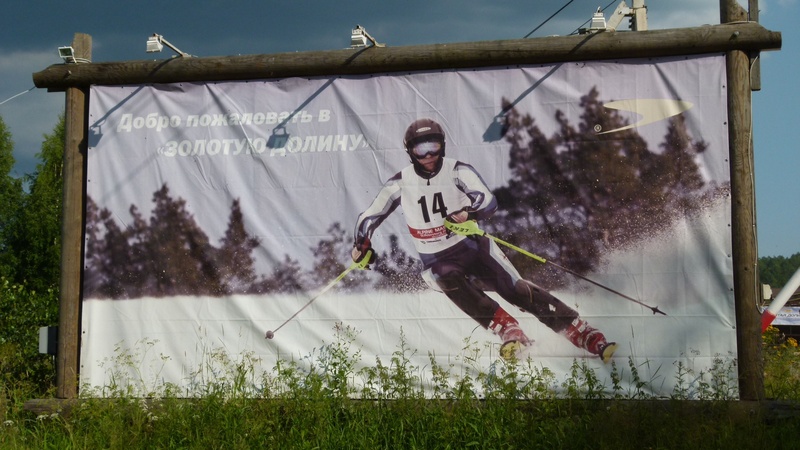 Larissa loves skiing, and many of her friends are alpine skiers (горнолыжники). Skiing here, where I can see no mountains? I can hardly believe this. But Larissa’s favorite photo shows her as an excellent carver. It must have been possible to acquire these skills here somewhere. And, true, there is a valley nearby with ski lifts that are open until May. Alexander has founded the golden valley and managed it for many years. Now his daughter has taken over. Larissa and her mum make sure that I can enjoy all the specialties that Russian cooking offers, be it сырники (hot cheese), пироги (pies with blueberries or mushrooms), marinated mushrooms, вареники (dumplings with blueberries) and more. I particularly liked the blueberry dumplings, and on my plate there was one without blueberries… “this will bring you luck”, Larissa says. This empty вареника is called пустышка (it is “empty” or пустая). 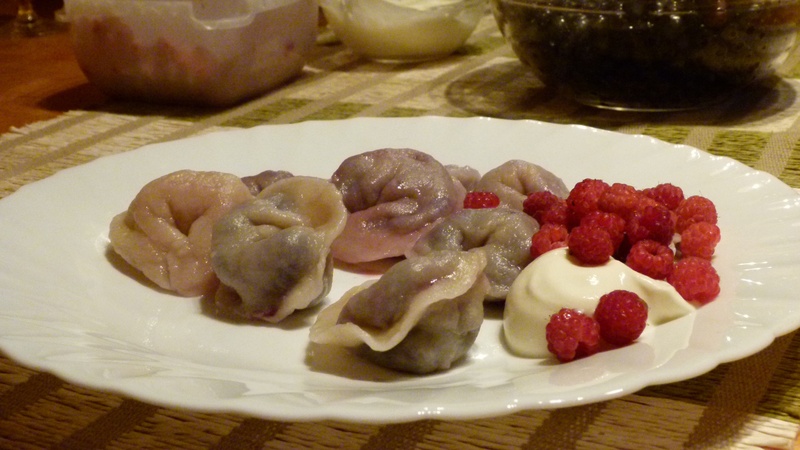 Later I hear that sometimes there was not enough filling for all the dumplings, and this is why the Russians invented the empty dumplings that bring luck – a nice idea! One evening, Larissa prepared a lovely шашлик (Schaschlik) barbecued in the garden, while it was pouring with rain. With this Schaschlik, we shared a tasty, dense Zinfandel from California (The Prisoner 2011) that reminded me of dried plums. A Russian-American marriage that I enjoyed much. One evening, Larissa and her mum surprise me with Russian poems. I am just always surprised, how many poems Russians can cite by heart, without having to stop and think. I already admired my Russian teacher and friend Anna that had grown up in former Leningrad, when she shared poems with friends at her parties. And here the same, Larissa and her mum do not stop… this is a short example – it is more a fun poem, but there were many, many longer poems starting with Puschkin and ending with modern poetists. everything now turns in your head. (This siskin is actually a tiny statue that brings luck to those that throw a coin at it). Yes, thank you, Larissa and Tamara, for your hospitality, and I hope that I can soon give back this hospitality in Switzerland. 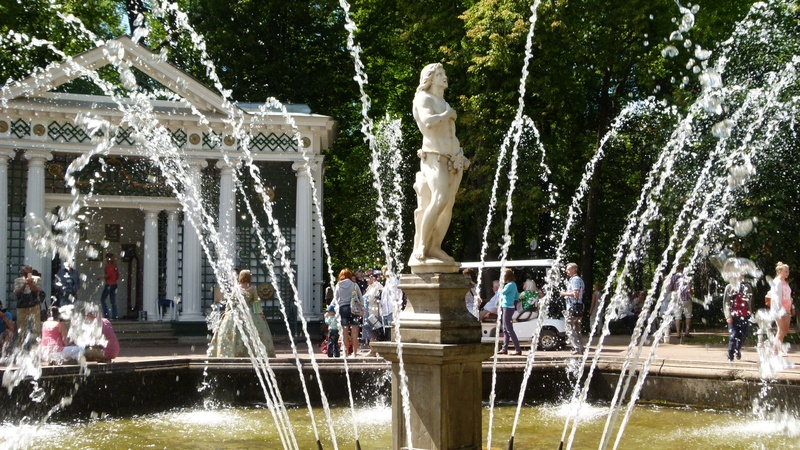 Just in front of the Ермитаж or Ermitage the meteor boats leave to take tourists to Peterhof within half an hour. I find a seat next to a young mum with her about 7 year old son who says that he is hungry. The mum unpacks apples and bananas for him. Very reasonable. He takes his mobile phone and makes a picture of a helicopter. “What do you need this helicopter for”, she asks in a friendly tone, “it will look like a small bee on your photo”, and she supports him to use the zoom to make it look like a small bird at least. “Oh, look at that black cloud, and we have no umbrella,” she sighs. Yes THAT cloud north of Piteri is very black. 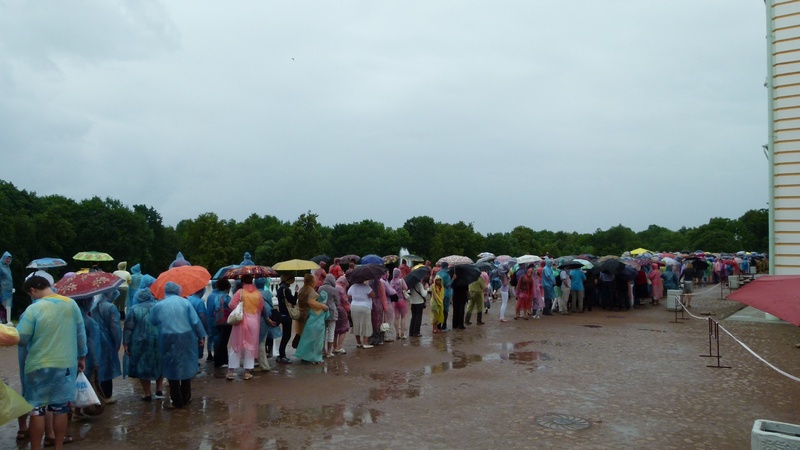 And as we arrive at Peterhof, it rains heavily and there is a strong wind. The tourists fight their way from the peer to the park and join the visitors there that have already bought a plastic coat or an umbrella at one of the kiosks. No, the museum is nothing for me. There are also caves to visit, but they sell 800 tickets per day and the queue is about that long… Hence I decide to just stroll through this wonderful park that Peter the Great has conceived and, in some parts, even engineered himself. 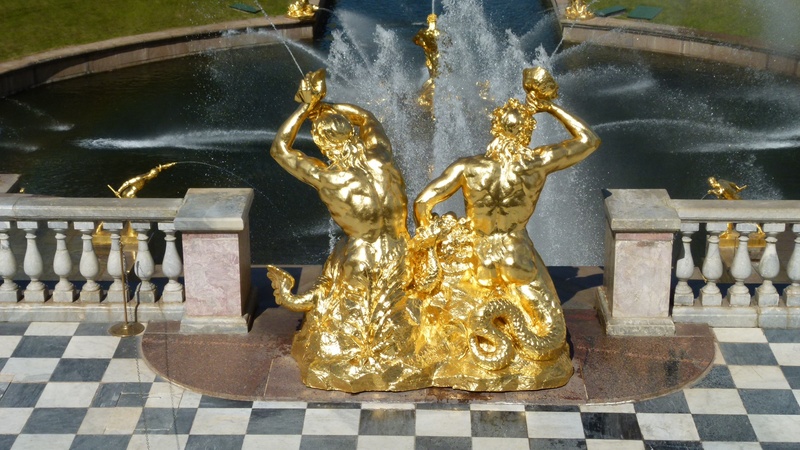 The great fountain with the golden statues, Adam and Eva, the fish pond, the fun fountains jumping up unexpectedly for the joy of children and the sore of their parents, the little Montbijou Palace at the sea shore which somehow reminds me of Sanssouci in Potsdam… and so forth – this is one of the most beautiful parks I know, and I just miss Ernst, as he has enjoyed this gem so much with me eleven years ago. In the small restaurant Бель Вю or Belle Vue I eat an уху or fishsoup. and around five pm I head for the peer to take he meteor back to Piteri. At the peer I join a long queue of tourists who are freezing under the cold wind. The meteor only approaches the peer quickly, fighting against the waves, to load the passengers all at once and then head off back to the Ermitage on a bumpy journey. I walk back along busy Newsky Prospekt (where I get some Nespresso capsulas for Elena’s coffee machine) and then along Griboedova to the house that is my home for four weeks. Elena and I chat until midnight – the white nights make us forget the time. 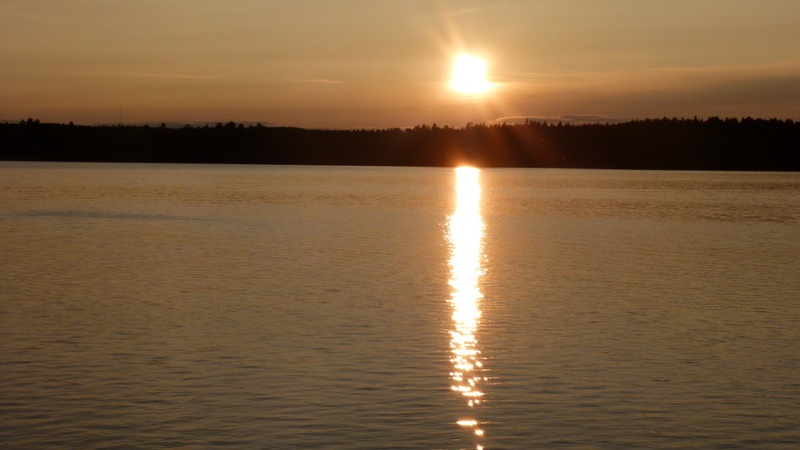 Larissa plans a long fishing weekend with friends at Puumala in Finland, where the glaciers have left a large number of lakes and 1001 islands. Wednesday night we fight our way through the rush hour at Petersburg to spend the night in the Datscha and then drive north to Finland. 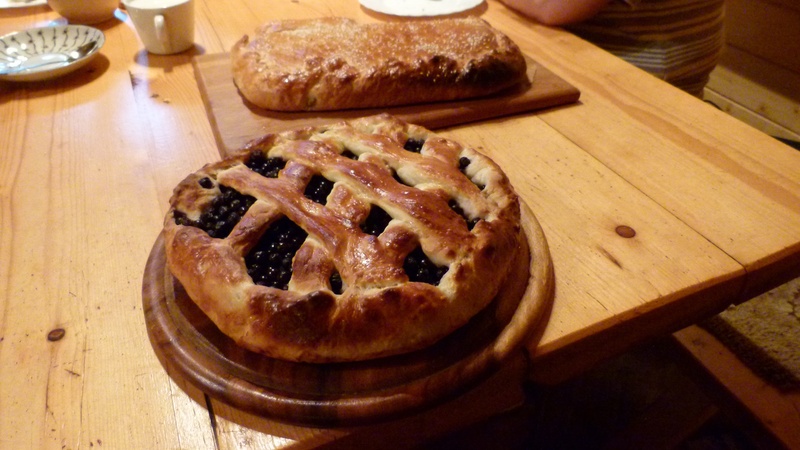 Larissa’s mum prepares a mushroom piroga and a blueberry piroga. A friend comes over and helps to load a boat engine and all parts of an inflatable boat. Larissa prepares material for the camping: Pots, flash lights, knives that cut well, a large board to prepare the fish we will catch and much more. The next day, we drive north, first on bumpy Russian roads (сonstruction work (ремонт) is slowing us down). At the border to Finland, we pass quickly. My passport with the multiple Visum to Russia is okay, and so are Larissa’s documents, including the license for the boat. “Look, how clean everything is here”, Larissa says. Yes, the roads are excellent. I no longer understand anything around me – so many vowels, often two packed together. Larissa speaks the language and I learn that “thank you” is “kiitos” in Finnish. There are large supermarket areas. Euro is the money here. We buy vegetables, fruit (also cherries, called Kirsi like in Swiss German). There is a great wine shop with wines from around the world at good prices (actually better and lesser wines all have about the same prices – I buy a Gewürztraminer from Hugel). The bottles that we will take back to Russia are sealed into a bag to get the tax refunded. We find our small hut no 1 at the Puumala camping site. Max joins us, and after a meal, Max and Larissa start to unpack their imflatable boats. They first inflate the body, then put the floor in (it has been transported in pieces), then the rows, the engine and some add-ons like a meter for the depth of the water or a navigator, and Max also installs lamps, because he wants to fish in the night. After more than two hours of hard work the boats are in the water. Larissa and Max park them beneath our hut. A short midnight dinner with Katja and her dog Roxie that have now arrived, and while we go to sleep, Max leaves to do fishing. Mischa and Kolja arrive and settle in the neighboring hut number 2. At 3PM on the first fishing day, our meter has spotted a lot of fish around stones and in the reeds (камыши), but not one of them trusted the many metal fish that the friends laid out to catch them. No шука (pike, Hecht), no окунь (perch, Barsch), no судак (pike perch, Zander). The friends try again in the evening – Mischa and Kolja bring back three fish around midnight and call us later to share their fish soup with them (уха or ucha). I enjoyed the boat strolls on the lake and into the bays, under a deep blue sky and in the warm sun. The lake is very quiet, almost no boats on it. On the second day, the lady boat catches one fish, and the two boy boats bring back something like six fish. They smoke the fish at the fireplace and make me try the tender result. Excellent. The friends leave for their second evening fishing, come back around midnight, as the sun has set now (but it is still not dark). 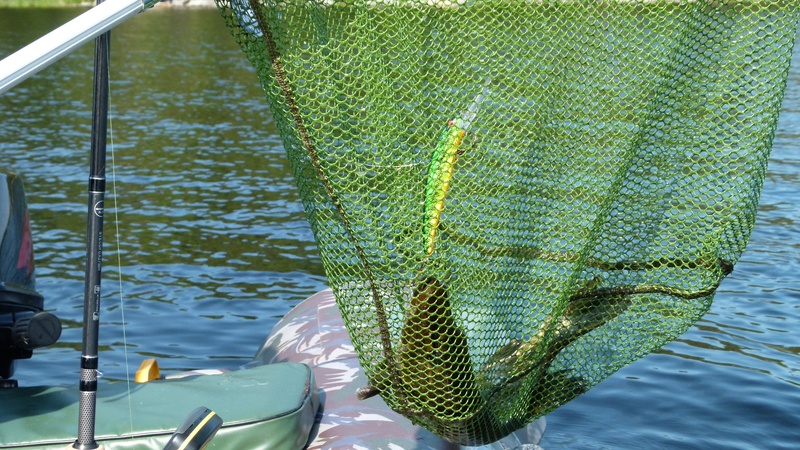 They have not killed the fish they caught, as they thought, they had already caught enough. We share our dinner with some wodka and some wine. 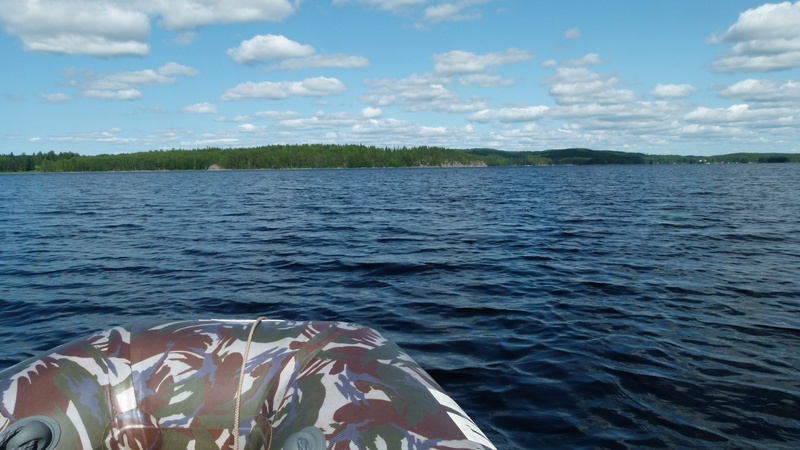 On Sunday morning the friends pack their inflatable boats and all the fishing instruments (again a long procedure) and drive back home to Petersburg. Larissa and I first do some shopping in Lidl and Prisma (large super markets) and then get some more fsh at Disa, a large super market juat built for the Russians. They come here even in buses. At the Datscha, Blini are waiting for us that Tamara has prepared. We eat them with salmon and kaviar from the Disa shop and with strawberry marmalade from the cellar. Thank you, Larissa, this was a great weekend. We leave Petersburg after the opera performance of the Flying Dutchman, at 10:30 PM. The sky is still bright and the sun shines. 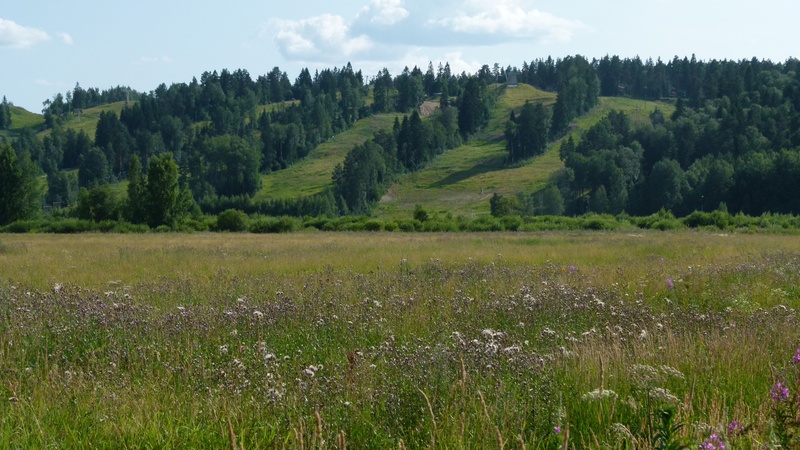 First we drive north on the large road to Finland, then we turn towards Ladozhskoje Ozero. The streets are now narrower, then bumpy, and at midnight Larissa’s mother welcomes us in the Datscha nicely tucked away close to the forest. The sun is slowly setting and we share some strawberries from the forest nearby (земляника) and from the garden (глубника). 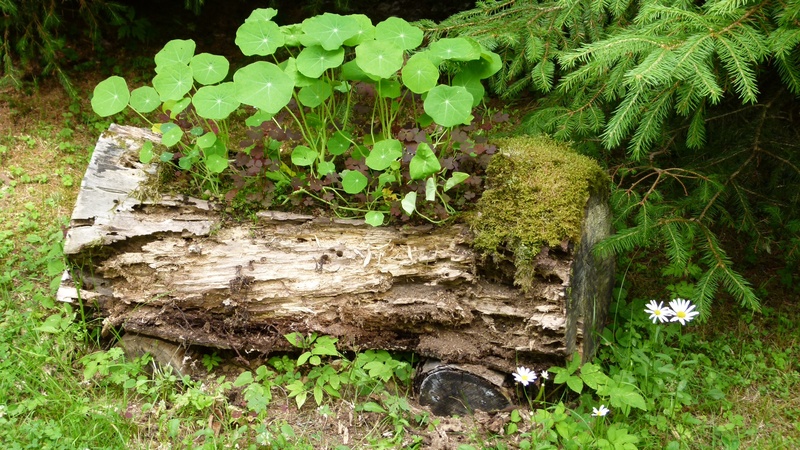 On Sunday I join the Russian tradition to stroll through the woods and look for berries and mushrooms. Larissa explains the difference between “look for” (искать) and collect (собирать) mushrooms (грибы). While I find just two red mushrooms (красный гриб), Larissa and her mum find about 10 red mushrooms, 10 chanterelles (лисичка) and 2 сыроежка (Russula in English or Täubling in German). 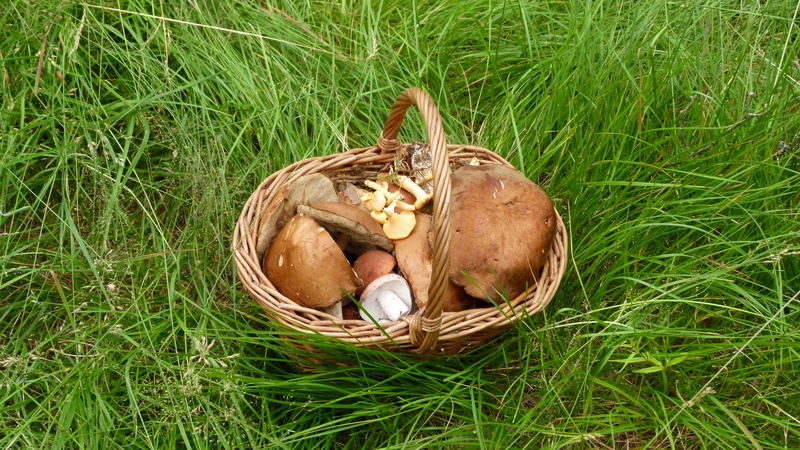 We had to look for the mushrooms, we could not just harvest or collect them. On the way we also eat and collect strawberries and blueberries. The fluffy dog Raily loves blueberries and chews them away from the bushes. For lunch Larissa’s mother prepares Beljaschi. This is beef and lamb meet packed into little sacks made from white paste, and they taste great. Larissa prepares a fresh limonade with lemon and ginger. The Wodka is spiced with juniper berries – I will have to remember this. In the evening we have a risotto spiced with the mushrooms we found today. A white wine from Tuscany accompanied the meal (La Pioggia). A salad caprese is the entry and strawberries from the forest are our dessert. I learn that in Russia the mushrooms are first cooked in boiling water. This is what I watch Larissa’s mum do and this is what Elena confirms, when I was back in town. Only the сыроежка is not cooked in water, and this is where the name comes from (eat them raw). The village is a skiing resort; Larissa says that here you ski on hills rather than mountains. 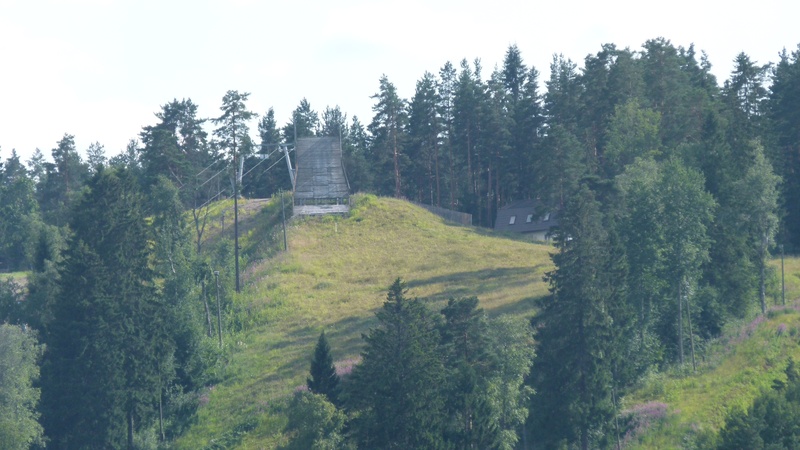 But the hill looks nice, there are several ski lifts and several ski resorts here. The lifts start at 9 AM, when it is still dark in winter; the sun rises around 10 AM. Well, we are quite far north here.